Most preppers have something they stock up on because they know it will be very useful after the SHTF. For example, honey, baking soda and other useful foods can be used in dozens of different ways. And today I want to talk about another useful item: cornstarch. Yes, that stuff in the back of your pantry you probably never use. Cornstarch is often used to make foods thicker, fluffier and a little heartier. Adding cornstarch to soups and stews is an excellent way to thicken them up and make them a little less soupy. Spaghetti sauce, homemade or out of a can, can also be thickened with a little cornstarch. And if you want some delicious gravy, just mix a little cornstarch, meat drippings and broth together. Cornstarch can even be used to make omelets fluffier. Here are some more ideas. Now that we’ve established cornstarch as an excellent food for any survival pantry, let’s talk about some of the other uses for cornstarch. Believe it or not, you can use cornstarch to clean carpet, wash windows, deodorize shoes, repel insects, soothe rashes, and much more. And on top of all that, cornstarch is 100% natural. In this day and age, it’s more important than ever to avoid the many unnatural chemicals in almost everything we buy at the grocery store. Warning labels that discourage you from inhaling, touching or ingesting anything should be a big red flag. But you won’t find any warning labels on a box of cornstarch. 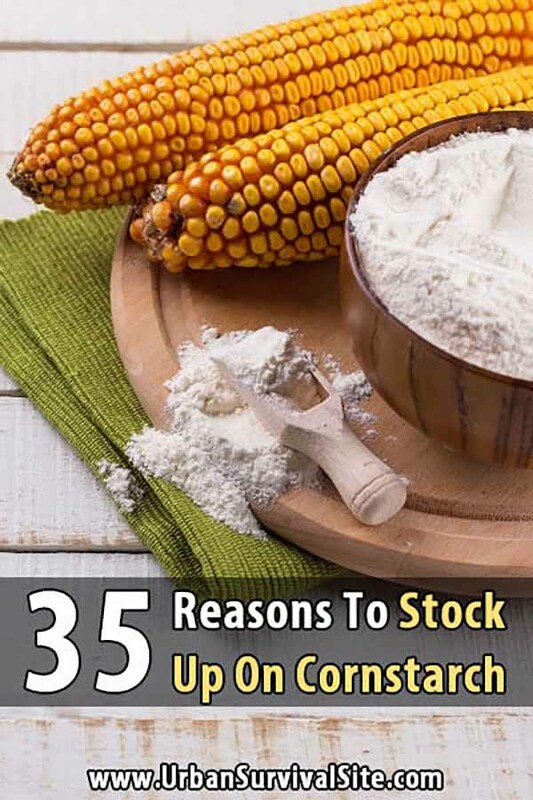 Let’s get to the 35 reasons why you’ll want to add plenty of cornstarch to your emergency supplies. Most of these aren’t things that are critical for survival, but the point is that during a long-term disaster, you won’t be able to run to Walmart for every little thing. That’s why you need versatile items like cornstarch to help you become more self-reliant. Plus, it will save you money. Cornstarch can be gently rubbed into a tough stain on your clothing. Add a little water to make a paste and spread it on the stain. Put the soiled clothing in a sunny window or on the clothesline and leave it for a while. Once it is dry, scrape the cornstarch away and look for signs of the stain. Repeat as needed, and wash as you normally would. This is a great way to get out tough blood stains and ink stains. This is super easy with a little cornstarch paste. Add a little water to a few teaspoons of cornstarch and mix it up to get a thick paste. Use a soft towel to rub the paste on the silver, then wipe it away with another clean cloth. Carpet cleaning is another easy way to use cornstarch. If it’s a liquid stain, use a towel and pat the area to remove the liquid. Sprinkle cornstarch over the area and let it sit for 15 minutes. Vacuum the cornstarch and the stain away. You may need to repeat this a couple of times. If you have a squeaky floorboard or stair step, sprinkle some cornstarch on the area and use a broom to brush it in between the cracks. No more squeaking! Sprinkle a bit in your tennis shoes or boots to eliminate stinky feet. It will also help absorb moisture from sweaty feet. As a bonus, cornstarch can help prevent and cure athlete’s foot. Cornstarch can be put under your arms to eliminate or reduce armpit odor. In a SHTF situation, this will be an excellent alternative to deodorant. For example, old stuffed animals that have been on your kids’ beds for years can be freshened up with cornstarch. Sprinkle some cornstarch on the stuffed toys and seal them in a large garbage bag for a few days. Take the animals out of the bag, give them a good shake or vacuum the cornstarch away, and they’ll be clean and fresh. Cornstarch can be used to keep your hair manageable when you can’t wash it every day. It absorbs the oils in your hair and on your scalp. Sprinkle a little cornstarch on your head and comb it into your hair. This is an excellent dry shampoo of sorts that cleans your hair when you don’t have access to water. Painful sunburns can be treated with a cornstarch paste. Rub the paste over the burned area and allow it to sit. Once dry, rinse away and repeat if it is still painful. Bug bite pain and itching can be relieved with a cornstarch paste. Rub the paste on mosquito bites, bee stings or spider bites to relieve itching, pain and swelling. Make a spray starch to use when ironing. You’ll want to mix about a tablespoon of cornstarch into a pint of water. Spray it on your clothing during ironing to give them that nice snap. Mix a quarter cup of vinegar, two cups of water and a tablespoon of cornstarch together and spray it on your windows. Once you wipe it away, your windows will be clean and free of streaks. Use newspapers to wipe the windows down to remove any glare. Sprinkle cornstarch behind your refrigerator, in any cracks in the foundation, and under the sink. This will repel cockroaches, which is very important after the SHTF when sanitation is lacking. You can untangle a tight knot in your shoestring or on a rope you need to use by sprinkling a little cornstarch over the knot. Like magic, it will become loose enough for you to get undone. Sprinkle cornstarch on your furniture and use a towel to rub it in. The cornstarch can remove any old polish that may have built up and reduced the typical shine of a wood surface. Sprinkle cornstarch in areas that tend to chafe such as behind the knees, between the thighs, or in a baby’s diaper to prevent diaper rash. Fingerpaint is easy to make with some cornstarch and boiling water. Add enough cornstarch to make a thick, smooth paint. Then add a few drops of food coloring for fun. It can be used as facepaint as well. This is a good way to keep the kids occupied after the SHTF when there isn’t any power. Yes, cornstarch can be used to powder your nose if you want to reduce a shiny complexion while absorbing oil on the skin and making pores look smaller. Musty books can be bothersome, but sprinkling a little cornstarch on the pages will remove that mildew smell and help fight mold growth when books have been stored in a moist basement or exposed to flood waters. Seriously. You can add a little color to your cheeks with homemade blush made from cornstarch and a sprinkle of cinnamon or hibiscus powder. You can also use this as a bronzer. Dust the handle of your knife, axe or tennis racket with a little cornstarch to give you a better grip and prevent it from slipping out of a sweaty hand. If you have a shirt with an iron outline scorched into the fabric, dampen the material and then sprinkle cornstarch over the area. When it has dried, brush the starch off the shirt and it should be good as new again. Sprinkle cornstarch over your dog and then brush. The dirt and grime will cling to the cornstarch and your dog’s fur will be clean and smell great. A bleeding cut can be staunched by putting cornstarch over the wound. Apply pressure and the cornstarch will speed up the clotting process. Keep that deck of playing cards from sticking together by dropping the cards into a paper bag with a few teaspoons of cornstarch. Shake the bag to coat the cards. They will be good as new and nobody will be accused of cheating. Scented body powder will be a nice luxury after the SHTF. A cup of cornstarch and 10 drops of your favorite essential oil, like lavender, peppermint or orange can make you feel fresh, smell great and keep the sweating to a minimum. If you have a garden, dip things like corn, tomato and bean seeds in a cornstarch paste before planting them in the ground in the spring. The paste will keep the seeds warm and the energy from the cornstarch breaking down will keep the seeds warm in the cold ground, allowing them to sprout and take root sooner. Dust the leaves of your vegetable plants with a layer of cornstarch to keep pests off. They won’t want to crawl on the plants that have cornstarch on them. Sprinkle a little cornstarch in your rubber gloves before and after cleaning. This makes it easier to get them off and on and prevent the moisture building up inside and making them stink. Mix 2 tablespoons of cornstarch with 1 tablespoon of water to create a tough scrubbing solution to use on pans that have caked on food. Add a bit of cornstarch to a grease stain on a leather couch or your leather coat. Allow it to sit overnight. Wipe away and the greasy stain will be gone. Make a nice, cleansing facial mask with two teaspoons of corn starch, two teaspoons of milk and an egg white. Rub the paste on your face and allow it to dry for 15 minutes. Wash away and your skin will be clean and feel fresh. Mix some baking soda and cornstarch in a cup of water and rub the mixture on burns. Use this remedy if you have burned yourself in the kitchen or after getting too close to a fire. Add about half a cup of cornstarch to the bathtub to take care of any persistent rashes. The water and the cornstarch will soothe the rash and help speed healing. Pat the area dry after soaking for about 15 minutes. Sprinkle cornstarch over a mattress to absorb any liquids and odors. Vacuum the cornstarch after it has been allowed to sit for about an hour. You can probably find dozens of more uses for cornstarch in and around your home. It’s easy to come by and doesn’t cost much. Imagine the money you can save by eliminating some of your household cleaners and personal hygiene supplies by switching to cornstarch now. All that money you save can be put to buying extra food and emergency supplies. You can get four 2-pound boxes of cornstarch for as little as $28 on Amazon.com. Cornstarch is great for lots of things, but it is not totally harmless as a food. Our family does our best to avoid GMO products, and a goodly amount of the corn in this country is grown with Round-Up – i.e. glyphosate.